FaceApp’s gender filter offers possibility for trans and gender-curious users. As a full-time drag queen, I’ve spent a lot money, time, and makeup trying to look like a lady. But now there’s an app for that. FaceApp, a new mobile app that allows users to switch the genders of their selfies with the touch of a button, has sparked a social media frenzy. Since launching in February, it has garnered millions of downloads, inspired reams of think-pieces about race and beauty—and fueled thousands of gender-bending #faceapp posts on Twitter and Instagram. FaceApp offers many filters—users can see older, younger, or hotter versions of themselves, and so on—but the gender-bending option is one of the most popular among the gay male users in my social media sphere. And to be honest, it’s the filter that has me staring at my iPhone while no one’s looking. For some gay users, FaceApp’s gender flip filter is probably no more than a novelty. “I feel like all I’m learning from the #FaceApp is that a lot of my male friends would make beautiful women,” journalist (and Outward contributor) Nico Lang tweeted. At a moment when Rupaul’s Drag Race has many gay boys dabbling in the art of drag—and finding it more difficult than anticipated—it’s no wonder that FaceApp has been snapped up by queer guys as a shortcut to the joys of self re-invention. Why spend hundreds on brushes and powders when you can see your lady self for free? And in this way, FaceApp is nothing new. Back in 2010, the Dragulator app became popular with users who wanted to spruce up their boy pics with drag makeup, loud outfits and colorful wigs. Meanwhile, there are plenty of other popular video- and photo-morphing apps that allow users to twist and tweak their favorite subject—themselves—and quickly share the results with friends. We homos can hardly take a brunch selfie anymore without adding a tastefully effeminizing SnapChat flower-garland filter to our brows. Perhaps this is what has made FaceApp such a sensation—the sense of true transformation that it offers. Dragulator and SnapChat seem to ask “What if your image looked like this?” But FaceApp’s filters ask: “What if you looked like this?” In SnapChat, I see my image decorated with cartoon dog ears. But in FaceApp I see myself with a jaw reduction, lip plumping, cheek fillers, eye augmentation, microdermabrasion—and it all looks so real. To borrow Hume’s thinking about well-executed portraits: When a likeness is convincing, it elicits an empathetic response, as if we are regarding a real person. So, when looking at a FaceApp image, I feel like I’m seeing not only an image of a new face, but an image of a new Self, perhaps even an alternate life. It’s a much more magnetic and compelling experience. I first encountered FaceApp just before its wave of popularity crested. My friend Katelyn, who always tells me what kids are into these days, convinced me to pose so that we could try some of FaceApp’s filters on my face. In a few seconds, I was looking at four versions of myself. A mundane selfie. An age-progressed portrait. A “hot” (read: “less Semitic”) image. And then—there it was—a female version of me. Not a drag makeup or Pic Art version. A photorealistic rendering of someone who had been born a cisgender woman, or perhaps transitioned at a young age. For someone who has never questioned their gender, regarding an image like this might not be so arresting. But, as I’ve written before, I’m not one of those people. Sometimes I think that I stick with my assigned gender for the same reason I stick with the New York City subway. It’s familiar, and while I know there are other options, I’m not sure what they are, how they work, where they will take me, or if I can afford them. 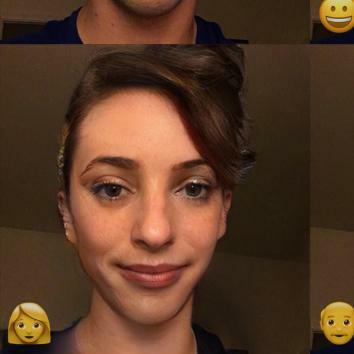 By creating a totally compelling—albeit stereotypical—image of a female me, FaceApp played on that complex relationship with gender in a totally unexpected way. Looking at a lady version of myself is unsettling, even heartbreaking. Actually, I’m not totally sure what I felt or why. In trying to describe that moment, I can only come up with this: I feel for female me the same pang that I feel when looking at age-progressed photos of missing kids who will almost certainly never be found. And, looking at the thousands of #FaceApp selfies across social media platforms, I don’t think I’m alone in this feeling.